Welcome to this unique townhome at the Glaciers' Reach, the Whistler Village premier location, located minutes from ski lifts, grocery stores, coffee shops and playground. This extra large 1 bedroom townhome is a perfect vacation home for families of 5 or couples looking for a romantic getaway. 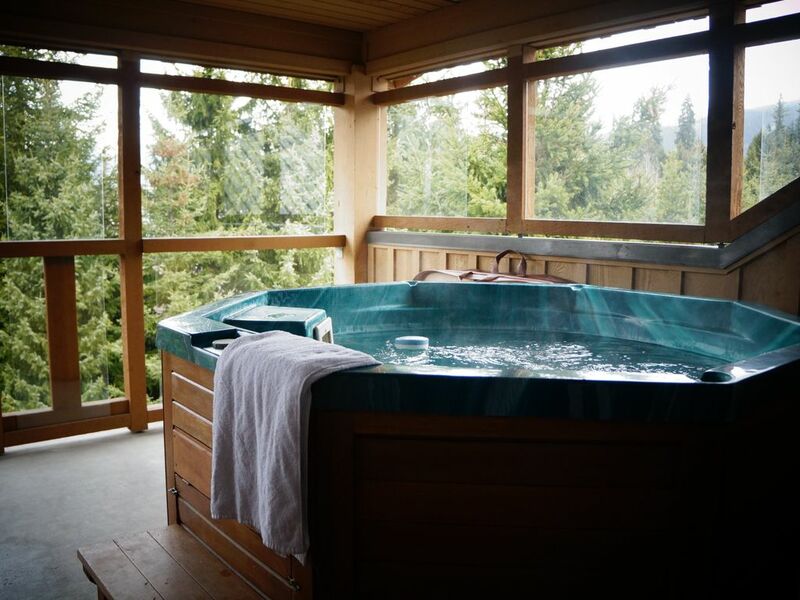 Enjoy stunning mountain views while relaxing in the private hot tub on the covered patio. You won't even need a car if you stay at our townhome - it is located only minutes away from shopping, ski lifts, restaurants and trails. This is one of the few Whistler townhome complexes with a heated outdoor swimming pool and hot tub. Free Wi-Fi, parking and bike locker are included. Our home features a spacious living room with a queen size sofa bed, chair bed, 40'' Smart HDTV, including free Netflix, and dining set that comfortably seats 4 people. The kitchen is equipped with a full range of appliances - everything you need to treat yourself with delicious meals on vacation. The living room is connected to a balcony where you can enjoy mountain views while drinking your morning coffee. The third floor features a bedroom with a queen size bed, with 32'' HDTV TV, and a large bathroom with a tub. The bedroom is connected to a huge covered patio with a private hot tub and a comfortable patio set. This extra large 1-bedroom unit sleeps 5 people comfortably and has plenty of storage space. For our guests, we offer free Wi-Fi, free parking and a bike locker. It is located in the Glaciers' Reach, one of the few Whistler townhome complexes with a heated outdoor swimming pool and hot tub. Great location, fully stocked and equipped for your time away. We arrived, at check in, to an easily accessible, safe, clean and fully stocked suite with all the amenities you could need during your time away in this beautiful destination. There were a couple of hiccups, however the owners were quick to rectify things. Would for sure stay here again! Great place. Loved the private hot tub. Walking distance to everything. My wife and I stayed for 2 nights for her birthday and this unit was perfect for a quick weekend getaway. The location was absolutely perfect. We parked our car when we arrived and didn't touch it until we left. Everything is less then a 10 min walk. The private hot tub with a mountain view was the cherry on top. We would definitely rent this unit again. First class accommodation, great location, great communications. We stayed here for 3 nights and absolutely loved it. We hired bikes for two days to explore the area. Just opposite the marketplace so it is easy to access for bars,shops and restaurants. Everything was as advertised. We had a great stay and rent again without hesitation. Private hot tub was a great way to unwind after a day on the mountain. My boyfriend and I rented the apartment for 2 nights to enjoy the mountains and rest in the hot tub in the evening. The place was spotlessly clean and had every amenity we could have needed. Our hosts gave us ample information before we arrived so we found it just fine. Our only negative was that we wished we could have stayed longer!